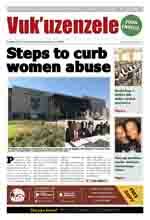 Government's learnership programme has started to show positive results. Many young people are now receiving training from different companies. The learnership programme is part of government's wider plan to develop skills among young and unemployed people. The Mechanical Engineering and Related Sector Education Training Authority (MERSETA) is one of the sectors that makes sure skills development takes place. MERSETA is one of the 23 Sector Education Training Authorities (SETAs) started under the Skills Development Law. Frans Mamabolo is one of hundreds of young people who benefited from MERSETA. He studied Electrical Engineering at Kempton Park Technical College in Gauteng. After Mambolo completed his studies he could not find a job. 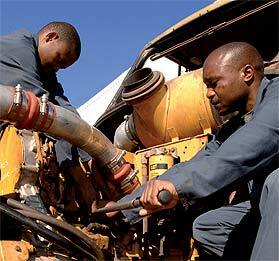 He applied for Barloworld Equipment's learnership programme, and was successful. He fixed caterpillars and road works machines. 'Since I joined Barloworld in 2004 my life has changed. I have gained more practical experience,' he said. Mamabolo, 28, wants to gain more experience to be able to start his own business. His advice to young people is: "Be patient, work hard and the opportunities will come." Another person who benefited from the Learnership Programme was Thato Moletsane, 25. He also applied to train as a learner at Barloworld. Moletsane's application was successful and in 2004 he was employed as a fulltime staff member. Before joining Barloworld, Moletsane studied Engineering at Talatso FET College in Mafikeng, North West. "Learnerships play an important role in improving the lives of young people. Young people should stop sitting around doing nothing. They should go out to get information and use opportunities that exist," he said. Anyone who is interested in training in a certain career (employed or not) qualifies for a learnership. Learners must meet the requirements set by different programmes. Do NOT apply for learnerships to MERSETA. Go to your nearest Department of Labour and fill in the Job Seekers forms. Attach your Curriculum Vitae (CV); The department will place your names in its database. MERSETA will take the names from the department and forward them to companies that need learners. MERSETA will pay the companies' costs of training. MERSETA gave bursaries to 151 students. 53 students are doing in-service training for their National Diplomas in Engineering fields. 3 825 students on learnerships have graduated. 1 456 people passed ABET level 1. As part of a National Tooling Initiative, ten learners funded by MERSETA spent 12 months training in toolmaking.